So, it's been about 3 months since I've last blogged, and I just want to thank you guys for being so supportive via social media. The time constraints that come with being a new mom have been a really difficult adjustment for me, and since I don't have many mom friends in real life, it's been such a soul-balm to have this community of women online who have been down this new-mom road and can offer words of kindness and reassurance when I'm feeling a bit overwhelmed. I haven't had the time to blog, but Instagram has become my lifeline to you guys in the past 9 months, as it's an easy place I can share things when my day is otherwise jampacked with chasing an energetic little tot around (She's crawling at warp speed now....omg!). So, to all of you who have interacted with me lately....thank you. Your words have done so much for my little world, and I hope in some way that this blog pays it forward and can make someone else feel less alone in their own journey. So, you guys, that's where I am today...chasing this little girl around. She's about to be 9 months old, and my world has been totally rocked. I'm so happy and excited and hopeful and filled with love, and also sometimes I'm just straight up drowning. But, mostly, I just want to be honest about it all because this mom gig is the hardest thing I've ever done, and I think it's a total disservice to other moms to pretend like it's easy. But, I love her like crazy and I wouldn't trade this experience for anything. I mean, just look at that precious face. I'm pretty sure she was sent to this planet to break me in. Now that the life updates are out of the way, let's move on to my small bathroom remodel. I know that's a weird transition, but how does one really talk about the trials of motherhood and a crappy bathroom remodel in the same post? I'm thinking you just mash them together and pretend like it's normal. So, I recently spruced up our small guest bathroom. 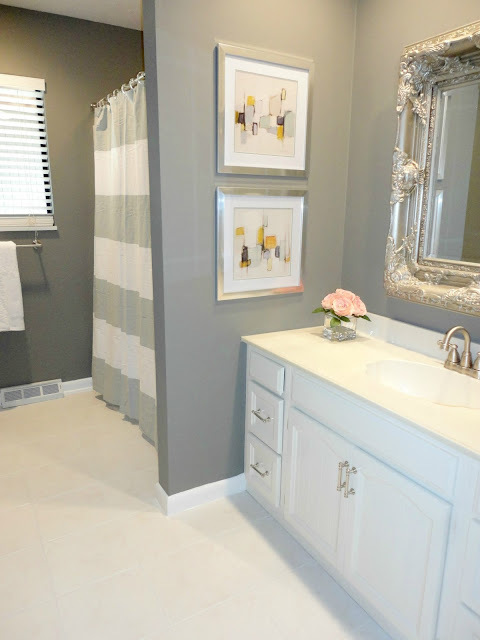 It's the same bathroom that I painted stripes in a few years back in this post that went unexpectedly viral. I know a lot of you guys loved that bathroom, so don't get mad at me. But, sometimes you just get sick of things and need to change it up. And that's how I was feeling about this bathroom. Just to remind you, here's what this bathroom looked like when we first moved into the house about 5 years ago, before I did anything to it at all. And here is what it looks like today, after my most recent updates. 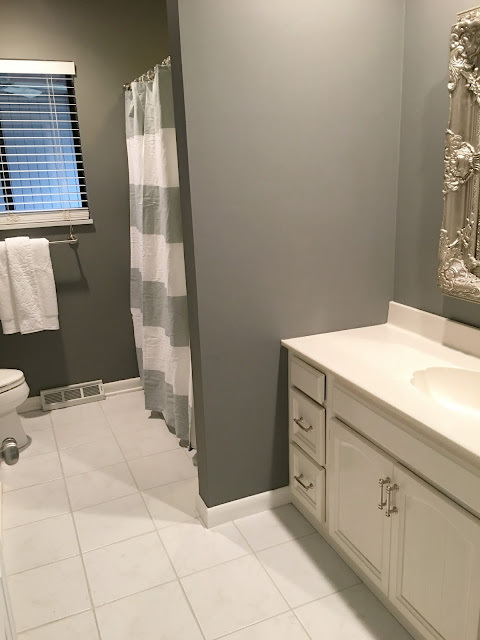 The good news for all of us on normal budgets is that this entire bathroom remodel cost me less than $100 and pretty much all it took was some easy paint ideas. 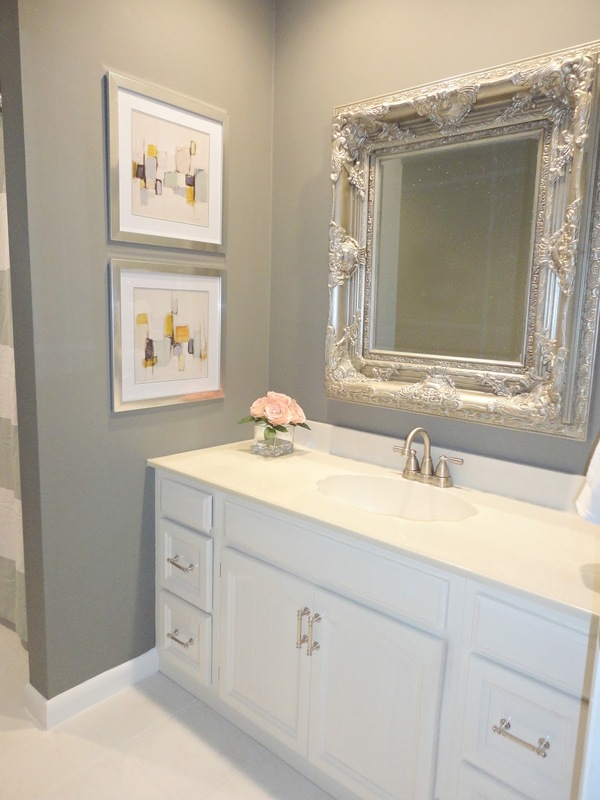 I painted the walls with one of my favorite colors, Benjamin Moore Chelsea Gray. It's a beautiful deep gray that works really well with almost anything. It feels modern and inviting without feeling too dark or heavy. For further examples, I also used it here and here. I also removed the builder grade bathroom mirrors and hung a framed mirror I found at a salvage shop several years ago. It was originally a gross bronze color, but I spray painted it with Krylon Champagne Nouveau (affiliate link) and I love the way it turned out. I kinda think it makes the space. Also, fyi, that is the my favorite spray paint color. Hands down. 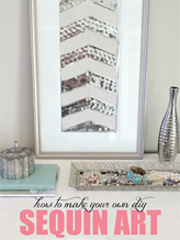 I use it on all my mirror frames, including the one in the master bedroom that so many of you guys ask me about. The bathroom vanity I painted with some oil based enamel paint (the same paint that I used on this dresser), and then I updated the hardware with some great polished nickel pulls. And then, also, because this vanity is stinky and old and from the 1970's, I took out all the drawers and painted the insides of each drawer with oil paint in the color Sherwin Williams Urbane Bronze. I also removed the old faucet and drain, and replaced it with a new brushed nickel bathroom faucet. 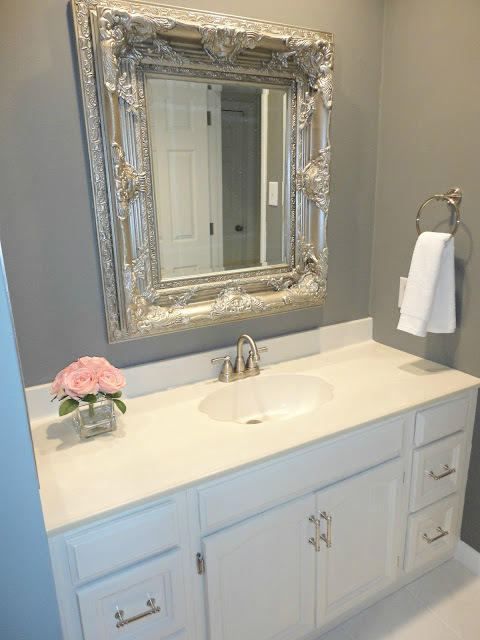 Nothing fancy, but with paint, new hardware, and a new faucet, you can really spruce up an otherwise outdated vanity. The countertop is just your basic white faux-marble. It's not great, but when you update everything around it, you almost don't even see it. In an ideal world, I would just gut this vanity and start fresh, but I have a child to feed. I added some artwork to the little half wall. Nothing fancy, just some Homegoods loot. 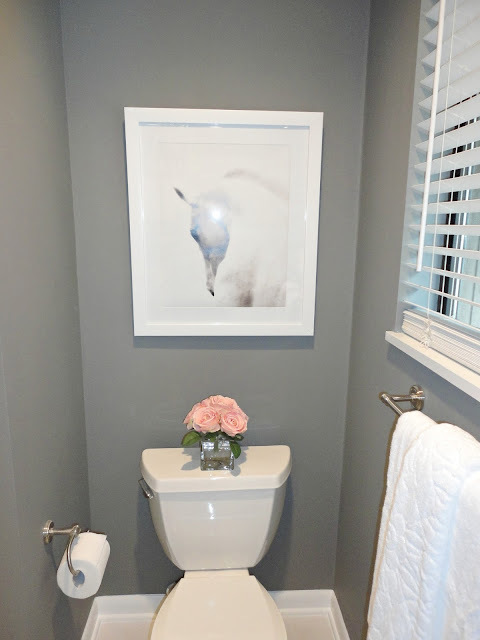 Also from Homegoods....the little peony arrangements and the black and white horse art over the toilet. And that's pretty much the whole makeover! So, when it came to this guest bathroom, the tile in here isn't bad. It's just old white marble tile, but the grout was 30 years old and really needed some help. So, here's the before pic. You can see how dingy the grout is. And here's a pic after I painted the walls. You can see just how much of an eyesore the grout was. 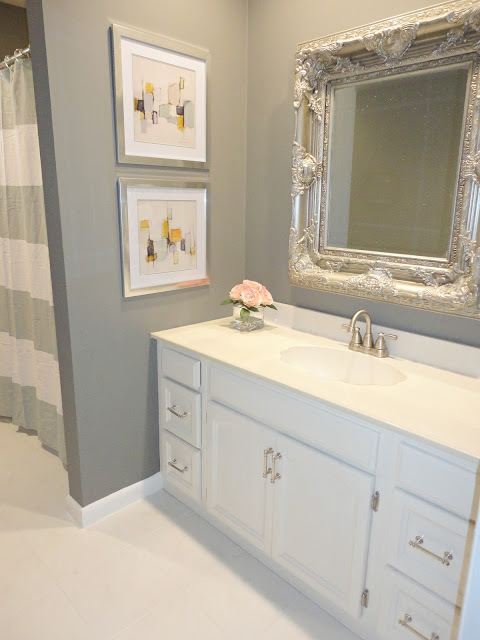 The product I use to paint grout is called Polyblend Grout Renew (affiliate link), and for this bathroom I used it in Snow White. I probably used 10% of this bottle when I painted the tile grout, so a little goes a long way. And I won't repeat the tutorial (because my original post goes through the entire process in detail), but let me just tell you....this is the easiest project. It's time consuming, but it's so easy. All you need is a toothbrush and some paper towels. And maybe a glass a wine to distract you from how tedious it is. You can really see what a big difference it makes when you see the painted tile grout next to the dirty tile grout. And once it's done, it's crazy...it truly feels like a new bathroom floor. 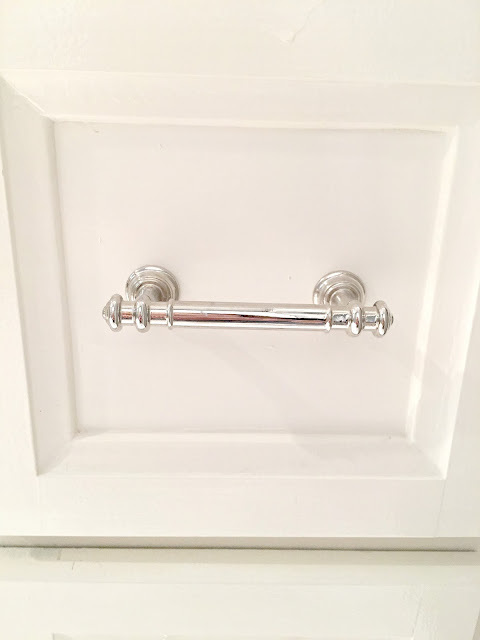 I've done this in three separate rooms now, and in my master bathroom, it held up for nearly 3 years before it needed a touch up. So, totally worth the effort. And that's the new guest bathroom, you guys. It's crazy how happy this crappy little room makes me. Nothing in here is new, but I spent a lot of time in here by myself, sitting on the floor in sweatpants so ugly they should be banned, scrubbing tile with a toothbrush, listening to podcasts, and enjoying a few spare moments of private peace knowing my precious baby was snoozing blissfully in the next room. So, is this what 32 is supposed to feel like? I've got some major things in the works for this spring and summer, and I'll definitely be blogging about it, so I hope to be around a little more than I have been. Fingers crossed. Looks terrific!! 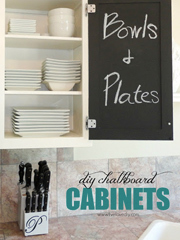 I love the color of the walls and it blends beautifully with the bright white cabinets and new hardware. Wow the floor difference is amazing! 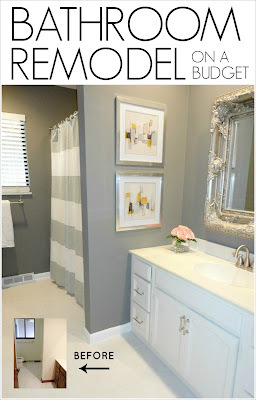 I love the fun mirror and the gray on the walls.. awesome job and so inspiring with the budget! I just went to Instagram to follow you but it says the account is private. I hope you accept my request! I am scriptysandy on there. Your bathroom is gorgeous and I am going to try that grout paint on my countertop grout lines until I can replace them. The bathroom looks fantastic! And on being a mom? It is rough! So many make it look so easy and gloss over the hard parts which, let's face it, is pretty much all of it. Hang in there. It does get easier...eventually...I'm told. But that is a lie. The struggles just change. My saving grace in the hardest time which is the time, age, that you are going through now, was a MOPS group. Google it if you are not familiar. It's "Moms of preschoolers" and it really saved me. Hang in there. You can do this! Wow, you changed the faucet and drain also. That impresses me. Great job! I am just about to take on our first home project- at least first entire room to take on. 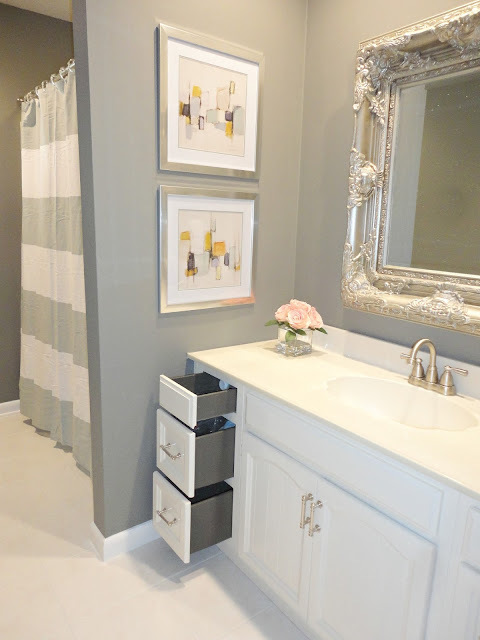 We are also going to do the guest bathroom first so this was a well-times post! My bathroom looks nearly exactly like your "before" picture! 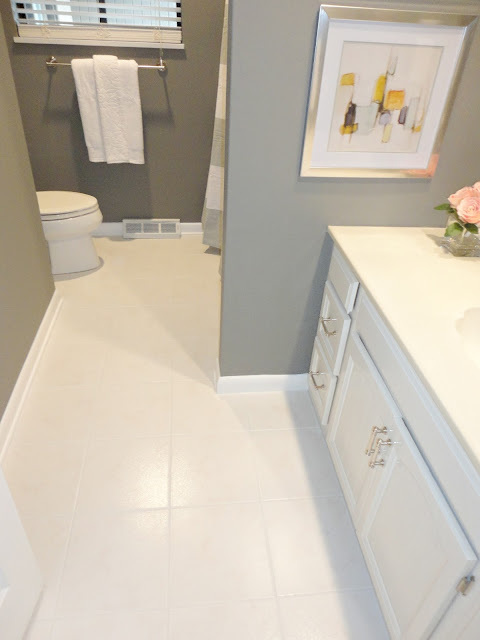 I really want to do white, but like you, I can't completely gut the bathroom and start with new everything, so what do you recommend for me having an of white tub surround and countertop? Can I still do white in there or will that look dumb? We have brown molding, but will the off-white rain on my white molding parade? Do I need to paint my vanity a color other than white? Great job on this bathroom!!! Love it! I really really love the horse picture! Great to hear from you and what a fantastic transformation. I love it. I just live for your posts, they are amazing! But I'm glad your taking your time and enjoying being a mother first and foremost! Truly gorgeous... and the floors look so white and clean... love it... oh and that baby--she's just too adorable. You are so talented at writing blog posts (they always cheer me up! :)) I've got two toddlers so I know what you're talking about!! LOVE your bathroom makeover! It looks great! That grout looks amazing. My husband and I are looking for a fixer upper to put our own touch on. I'm definitely taking notes to make it livable until we can do what we want to it. This makeover is super helpful because you can spend millions in the bathroom - ugh! I want something budget-friendly because like you, I have a 5-month-old baby to care for. By the way, your daughter is too stinkin' cute. What a gorgeous transformation. It's not easy when you have a little one to find the time or energy. I applaud you. As a grandmother now, I remember feeling I was being held hostage at times by my two kids, but each day I just remembered to myself that there will never be another day like today, and cherish the moments, whatever they bring. I am now enjoying visiting my two grandsons, ages 5 and 3 months. Gorgeous transformation. That mirror is to die for! It looks fantastic! It's amazing what a little paint can do! I especially love the small touches, like painting inside the drawers! Ah those baby days when life is full and wonderful but crazy. Your daughter is adorable. And eventually you'll have more time but enjoy these days. They do go by fast. Nice bathroom makeover! Love that mirror! You're back!!!! So glad to see you and Ava of course, and sending greetings from Dorset, England. Love the frame above the vanity - in fact, the whole bathroom looks great. This is awesome!!! 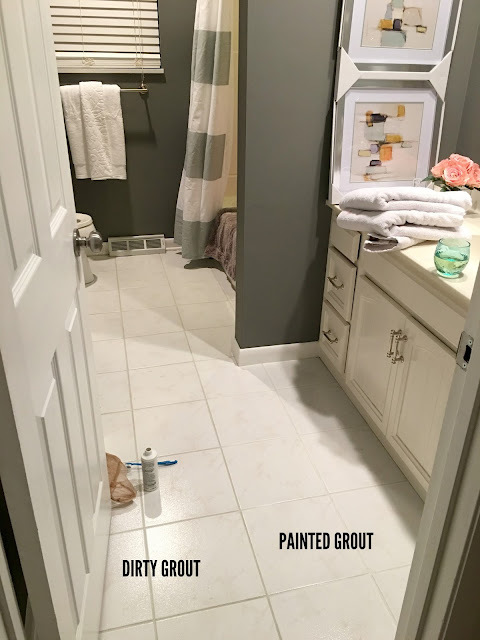 I had no idea you could paint grout!!! 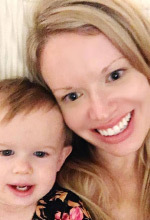 Great post and congrats on being a first time mom! Its amazing that you were able to get all of this together. I've got a little one with a second on the way and I know its a challenge. So you go girl! 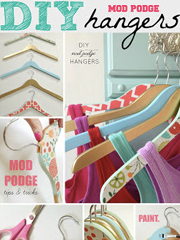 Ok. You've just added to my spray paint must haves! THANKS! Amazing what you did to the bathroom with just paint. 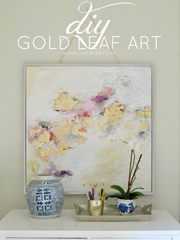 Great job and I love, love the homegoods artwork, especially the yellow undertone ones. And being a new mom - still, after two and a half years...- you have my sympathy. This motherhood thing is hard, hard, hard. This sounds odd but you were on my mind so strongly I prayed for you! Not knowing why. Thank you for posting such a fun post. I looked at the date of your old post and it said 2012. I could not believe it!!! No wonder you wanted a new faucet which led to new handles, and it all started with the glamorous mirror!!! You have a unique style. I love how you stay true to you even when you change things up a bit!!! And yes this is what 32 feels like...still have energy to do DIY while baby sleeps. Smile. Love this so, so much! You make me feel like I can do anything. I'm not a mom (and I don't want to be - eek!) but I admire you so much for being honest; I wish more moms were! I don't care how infrequently you blog, you'll always be one of my favorites! Yay! I'm so happy to hear from you again. :) I appreciate your easy and affordable home updates posts even more now that my husband and I are looking to buy our first house. 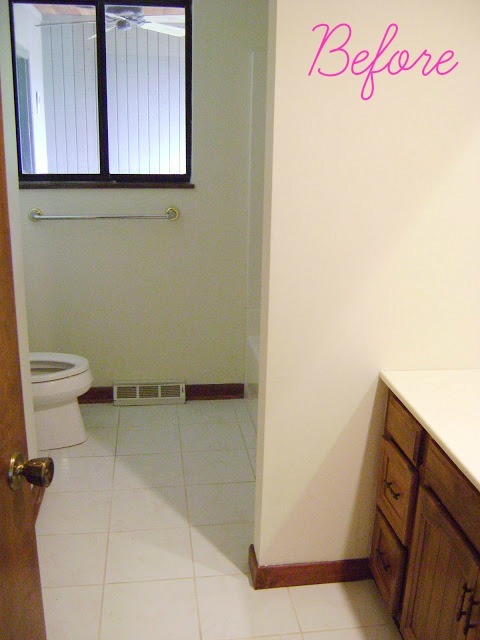 When I look at the online photos of homes for sale I am always dismayed by how outdated all the bathrooms look! :( This post gives me hope (and quite frankly opens up a door of possibilities for homes that I might otherwise pass on)!! Thank you for taking the time to write this up and for including awesome photos. You rock. Your daughter is beautiful! And the bathroom looks great. I am 62, and I'll tell you a secret, these are the best years of your life, enjoy them. Also, I will be doing the same grout thing, and my grandaughter may be napping as well. Some things don't chang. I love the hanging of the mirror in the bathroom instead of the standard glued ones. 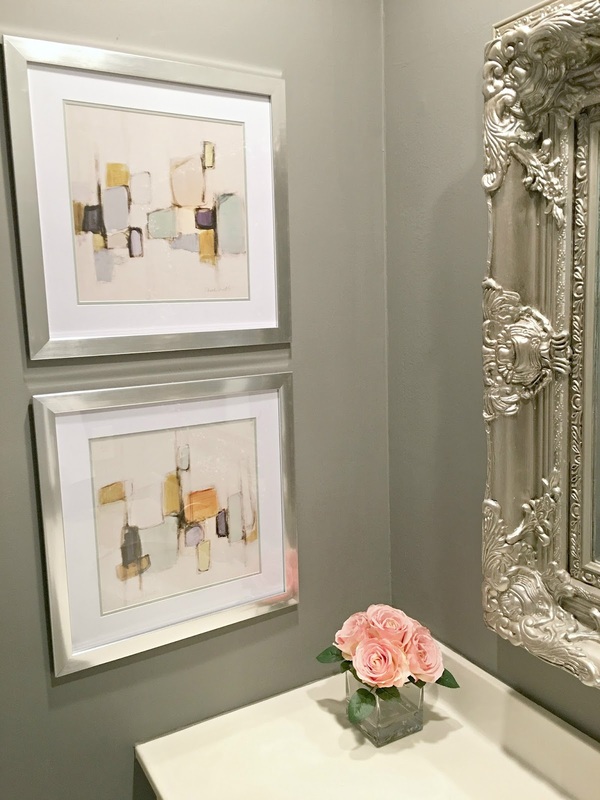 I have one powder bath that I did the same thing in, and in our guest bath I painted crown molding a similar silver color and then framed the existing bathroom mirror with it. Love the makeover, especially the mirror! 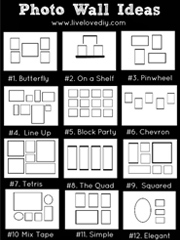 I've bookmarked the product for the next time I spray paint a frame. Thank you. This bathroom looks AMAZING! Thank you for your inspirational ideas. Can I ask where you got your striped shower curtain from? Virginia, that is fantastic! The bathroom looks gorgeous! 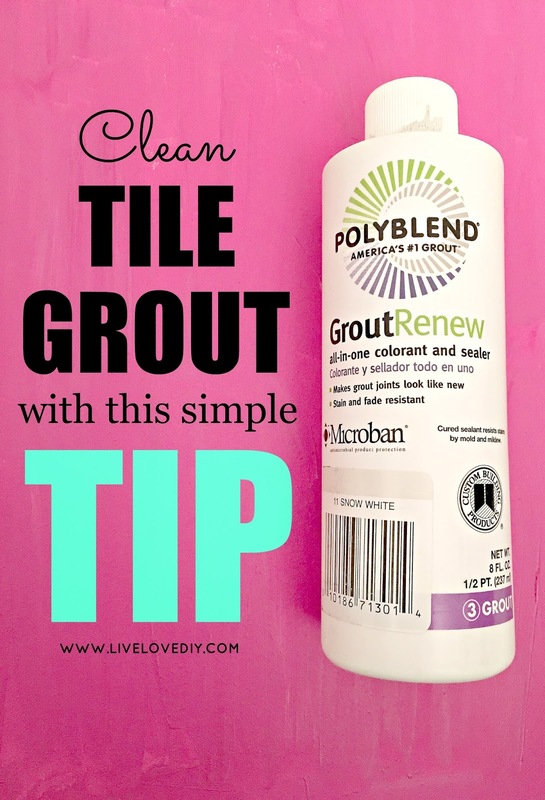 If any friends need to deal with ugly grout, I'm sending them to your tutorial. You are so talented !!! Love all the makeover projects you have done, I see the love you put on each one of your plans, the results are Simply AMAZING ! !